It's not just an ordinary PDA; check out some cool things the Nokia Internet Tablets can do! Sync your BlackBerry with Evolution. It runs Linux, and it's hackable. 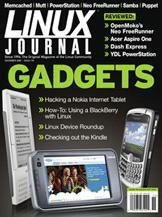 The world of Linux devices is becoming ever more dynamic and interesting.